. 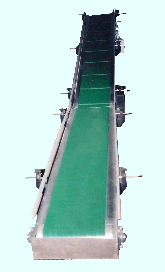 Belt Conveyors are suitable for different material handling applications.
. Belt Conveyors are manufactured in different frame designs (Bed Type, Stringer and Short Support Type) as per specific requirement.
. Belts used in conveyors are Polyester coated with PVC/Rubber e.t.c. min.